Please note that this is not affiliated with Apple's iOS. iOS is a very interesting GUI. The system is simply one executable and that's it. The executable is huge however, since all of the programs and games in iOS are in the executable and built into the system itself. This doesn't stop this nice GUI from getting things done. 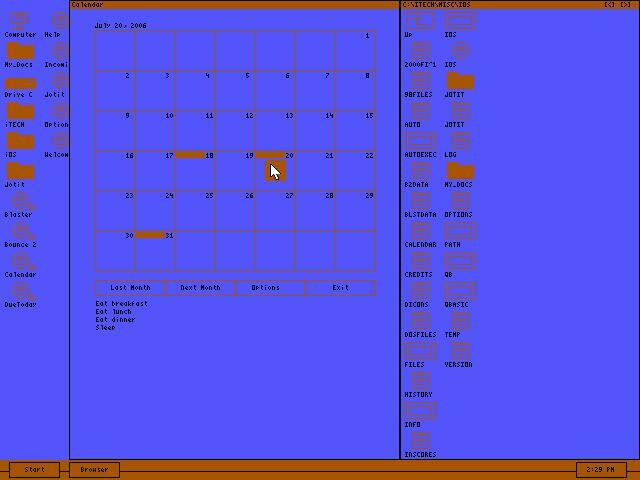 The GUI has much to offer and has the code to instruct. The only detail setting the GUI down is its style. The theme is a little too simple and maybe too colorless. A minor detail, but sometimes GUIs catch our attention with more attractive themes and styles. All in all, this is a great GUI I've seen. umm.. a file called IOS.BI is missing in the source code. I need it to compile the source as it is included in almost every file. Anyone have it or know where to get it?